High-ranking police officers and officials from the Ministry of Citizen's Protection, which oversees security forces, defended police's handling of disturbances during Sunday's rally against the Prespa Agreement between Greece and the former Yugoslav Republic of Macedonia (FYROM). According to an officer at Athens police headquarters, most of the 25 injured policemen now at 401 Military Hospital were injured during the attack on the stairs behind the Tomb of the Unknown Soldier leading to the Parliament building. 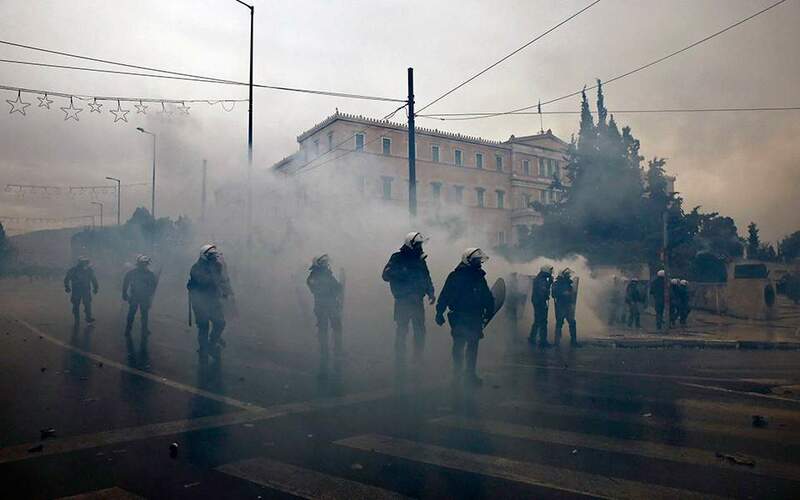 “Two have burns from firebombs and many more have broken arms and legs from the rocks and other objects thrown at them,” Demosthenes Pakos, president of the Athens Association of Police Officer told Kathimerini. Asked why police couldn't isolate the rioters, an officer at the Attica Police Division said that the masked rioters charged and then retreated into the crowd and, therefore, it was impossible for the riot police to chase them. The same source added that the extreme rightists responsible for the incident did not march as a group to Syntagma Square so they couldn't be identified and isolated beforehand. They became a group the moment they reached the location of the rally, he said. In a Twitter comment, Citizens Protection Minister Olga Gerovassili spoke of “extreme right violence and called on main opposition New Democracy to denounce the attacks on policemen, photographers and journalists. One protester, who was travelling on Solonos St., closer to the site of a counter-demonstration by anarchists – and who is said to have been carrying a Greek flag – was attacked by a group of anarchists leaving the counter-demonstration and heading to their preferred staging ground, the neighborhood of Exarchia. The man was stabbed in the buttocks and his motorcycle set on fire. Police say seven persons were arrested at Syntagma Square and will face a prosecutor. Besides the policemen, four persons were hospitalized with breathing problems from the tear gas and a freelance photographer, Kostis Ntantamis, was also hospitalized with injuries inflicted by protesters who kicked him while on the ground and hit him with clubs, also stealing his equipment. Three other photographers were also injured but did not require hospitalization. Besides the Tomb of the Unknown soldier, the masked rioters also tried to jump over barriers leading to the Parliament's open parking lot and the building itself, throwing objects and smoke bombs to police. They were pushed back. The overwhelming majority of the crowd demonstrated peacefully, many holding Greek flags or flags with the Vergina Sun (the 16-spoke symbol found at Vergina, northern Greece, at the tomb of Philip II of Macedon, father of Alexander the Great. FYROM had appropriated the symbol as part of its flag, but abandoned in in 1995 in exchange for an end to Greece's embargo and adopted a modified flag, with a different sun symbol). Police estimated those attending the rally at 60,000, adding that 326 buses arrived from outside Attica, 253 from the north, 71 from the west and 2 from Crete, by boat.